The Desgagnes tanker Damia Desgagnes has spent the past few days at anchor in the inner harbour. 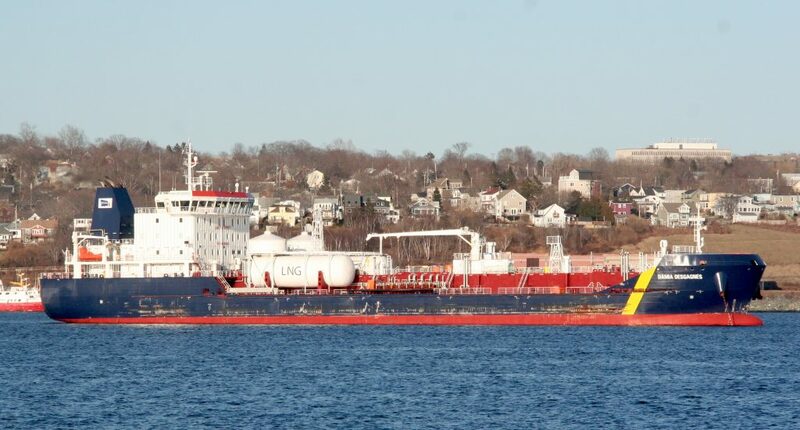 running between Montreal and Halifax, she’s carrying asphalt to the McAsphalt Dock in Eastern passage, and is scheduled to move to the dock at 10:30 tonight. The ship was built in 2017, And is a hybrid – she can run traditional fuels as well as LNG – or Liquefied Natural gas, which is stored on deck in 2 large tanks. Canadian Flagged, she is home ported in Quebec. This entry was posted in tanker on March 26, 2018 by Peter.